Somatic afferent: Exteroceptive sensations, e.g. touch/pressure and pain/temperature sensations are carried via ventral and lateral spinothalamic tracts respectively. To pass through the brainstem, before reaching their primary destination to thalamus, the tracts present compact bundle known as spinal lemniscus. Similarly, medial lemniscus is another compact bundle destined to thalamus while passing through brainstem. This carries proprioceptive sensations from muscles and joints, sense of vibration and discriminative touch. Before terminating in thalamus, these lemnisci send collaterals to hypothalamus. Special visceral afferent: These are the afferent fibers from the gustatory pathway. Axons of nucleus tractus solitarius ascend to ventroposteromedial nucleus of thalamus as solitariothalamic tract. Collaterals from this tract reach hypothalamus. General visceral afferent: General sensations from viscera, sense of stretch, compression or distension and pain sensation due to lack of oxygen following ischemia, primarily reach the autonomic center of brain (dorsal nucleus of vagus) and spinal cord (T1 – L2 and S2 – S4 segments). But finally afferent fiber from these centers ascend through reticular formation to reach hypothalamus which is considered as headganglion of autonomic nervous system. Visual afferent: Afferent fibers from visual pathway pass from opticchiasma to supraoptic nucleus of hypothalamus via retinohypothalamic tract. Olfactory afferent: Fibers from olfactory pathway pass to hypothalamus as medial forebrain bundle. Auditory afferent: This connection has not been clearly established. But it has been proved experimentally that sound stimulating cochlear pathway stimulates activity of hypothalamus. Descending cortical afferent: These are corticohypothalamic fibers descending from frontal lobe of cerebral cortex directly to hypothalamus. Hippocampal afferent: Fibers from hippocampus pass along the curved course of fornix to reach mammillary body. It is considered by many neurologists that hypothalamus is the main output path of limbic system. Afferent from amygdaloid body: These are the fibers of stria terminalis which extend from amygdaloid body around the curve of thalamus to reach hypothalamus. Afferent from thalamus: These are fibers reaching hypothalamus from dorsomedial, anterior and midline nuclei of thalamus. Afferent from midbrain: These are the fibers from tegmentum of midbrain. Descending efferent (to autonomic centers of brainstem and spinal cord): These fibers descend via brainstem reticular formation. Efferent to thalamus (mammillothalamic tract): These fibers pass from hypothalamic nucleus of mammillary region to anterior nucleus of thalamus. Efferent to neurohypophysis (posterior pituitary): Axons of supraoptic and paraventricular nuclei of hypothalamus extend upto posterior pituitary (neurohypophysis). These fiber bundles are known as hypothalamohypophyseal tract. Neurons of supraoptic and paraventricular nuclei possessing secretory functions liberate hormones vasopressin and oxytocin respectively. 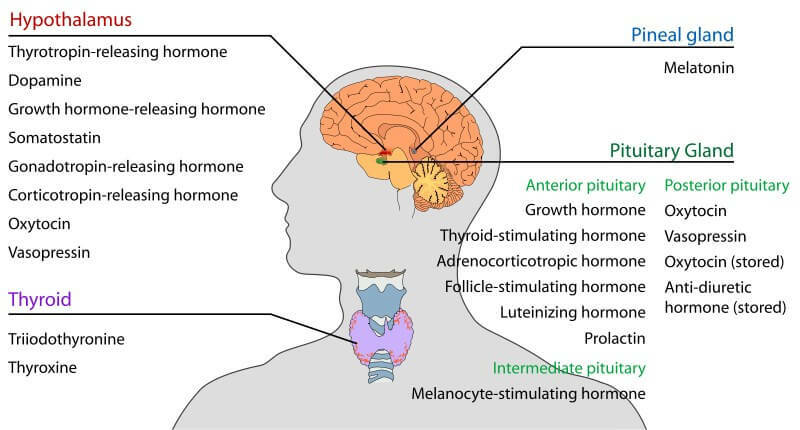 These hormones released from neurons of hypothalamus are transported though the axoplasm of the hypothalamo–hypophyseal tract to neurohypophysis (posterior pituitary). Finally the hormones circulate in the general bloodstream through the venules of posterior pituitary. Vasopressin (antidiuretic hormones) is vasoconstrictor in nature and causes reabsorption of water from distal convoluted tubules and collecting tubules of kidney. Oxytocin stimulates contraction of uterine musculature and myoepithelial cells of alveoli of mammary gland. Efferent for adenohypophysis (anterior pituitary): Neurons of tuberal nucleus of hypothalamus send axons to infundibulum of pituitary gland. These axon bundles are known as tuberoinfundibular tract which transports two hormones liberated by neurons of tuberal nucleus. The hormones are named as hormone releasing factors andhormone release inhibiting factors. These substances reach through tuberoinfundibular tract to infundibulum of pituitary gland from hypothalamus. Through hypophyseal portal system capillaries at both ends the hormone releasing factors and hormone release inhibiting factors reach the adenohypophysis (anterior pituitary) to produce influence on the endocrine cells.